Newly designed 18 in. 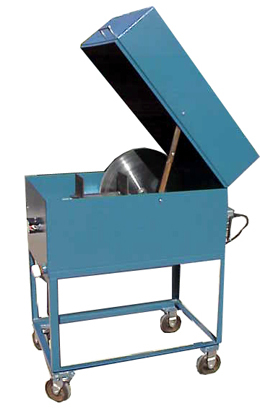 diamond lapidary saw. The box is laser cut, tig welded and powder coated for a beautiful finish that will last throughout the years. All parts are cnc machined for a precision fit. It has a 1/2 HP motor. The feed is newly designed and will give you years of trouble free service. The saw can be bought by itself or with matching stand on 5 in. casters. It come complete with saw blade. Diamond saw blades Diamond saw blades for cutting hard materials such as jaspers, agates and petrified woods or soft material like tile or glass. They come in several sizes and have a 1 1/4 inch hole in them so measure your shaft and will supply the reducers to fit most any size shaft.